October 5, 2010 - On Thursday, mid-day, flight attendants onboard a Cebu Pacific Airlines (CEB) flight from Manila to Butuan in the Philippines performed their in-flight safety check with passengers at cruise attitude. As the flight attendants began their check with music being played over the intercom, the flight attendants began dancing up the isles in what some say as seductive and unprofessional. While the flight attendants danced up the isles to Lady Gaga's Just Dance and Katy Perry's California Girls, the flight attendants demonstrated the aircraft?s safety procedures; use of seat belts, life jackets and the use the oxygen masks. Later in the day a video of the safety check was posted on YouTube. "The safety demo dance rendition is just another way to bring out our fun culture and showcase our homegrown talents. We plan to roll this out onto more flights after receiving great commendations from the global public. We still conducted the serious safety demonstration procedures; and the safety demo dance was done at cruising altitude right before our trademark Fun Flights. ?This was a test demonstration so that we can get feedback from our passengers. This does not replace the serious safety demo as required by CAAP (Civil Aviation Authority of the Philippines) said Candice Iyog, CEB Vice President for Marketing and Distribution. The Flight Attendants and Stewards Association of the Philippines (FASAP) has reported the behavior was inappropriate "flight attendants are safety professionals and to require them to dance in front of passengers is demeaning and undignified. Flight attendants are not entertainers." Cebu Pacific Airlines, along with all other Philippine based airlines have been banned from flying to the European Union with effect March 31, 2010. The European Commission said it acknowledges the recent efforts launched by the competent authorities to reform the civil aviation system in the Philippines and steps taken to address safety deficiencies reported by the FAA and ICAO and measures taken by two carriers Philippine Airlines and Cebu Pacific Air to ensure safety of operations. It is ready to support the Philippines to overcome serious safety deficiencies. 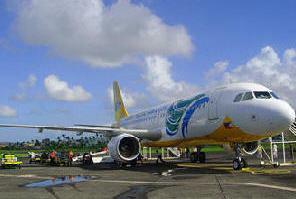 Cebu Air Airlines is based on the grounds of Ninoy Aquino International Airport Pasay in Manila, the Philippines. It offers scheduled flights to both domestic and international destinations. Cebu Pacific Air is currently the country's leading domestic carrier, serving the most domestic destinations with the largest number flights and routes, and equipped with the youngest fleet. The carrier has hubs at Mactan Cebu International Airport, Francisco Bangoy International Airport and Diosdado Macapagal International Airport. The company has 1,182 employees.